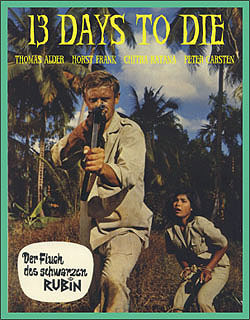 (1965) Thomas Alder, Peter Carsten, Chitra Ratana, Horst Frank. Here's a neat piece of intrigue laced with bizarre and exotic settings, including an ancient lost city filled with ancient stone idols and crumbling temples. The plot involves a priceless black ruby and a master criminal's demand for 3 million dollars for its return. It seems everyone who wears the elusive ruby eventually dies. What strange power does the ruby hold? In one riveting scene, the heroine is tied to bed. She looks up to the ceiling and, to her horror, sees dozens of hideous spiders crawling overhead. One of the bad guys bangs his hand on the wall and the spiders plunge down onto her writhing body! Whew! Watch for another scene involving catapults that are used for flinging men into a pool of bloodthirsty crocodiles! Great fun. From 16mm.